Today we are releasing Acacia – a machine learning enabled image compressor developed here in the School of Computer Science at the University of St Andrews. Acacia is the work of Oleksandr Murashko and Dr. John Thomson. 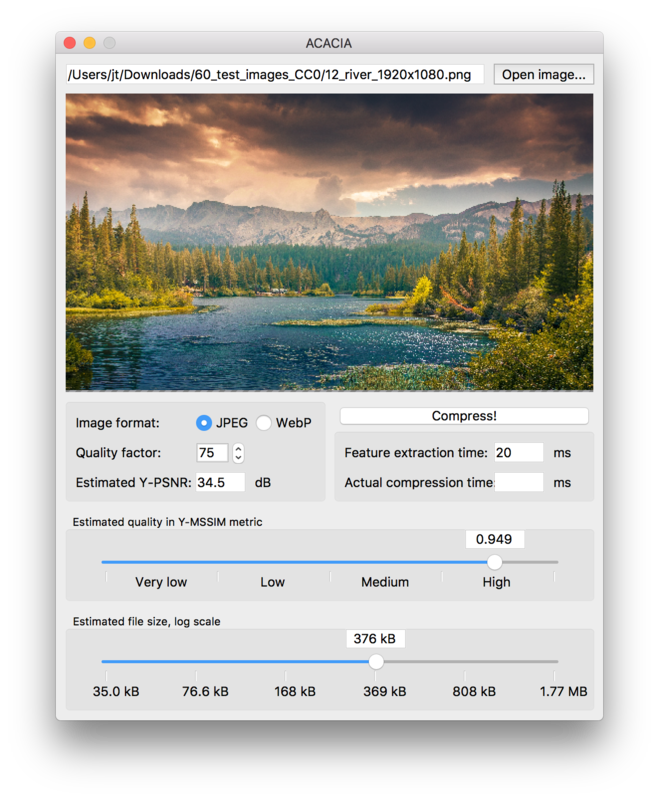 Acacia (Advanced Content-Adaptive Compressor of ImAges) is an image compression tool targeting at those who want the best compression under constrained energy or processing time scenarios – for instance a mobile device or a cloud image server. It allows users to target specific image quality or file size metrics when compressing an image with JPEG or WebP, with only minimal additional compression time. It does this by using machine learning to predict how an individual image will be compressed, and adjusts the aggressiveness of compression accordingly. Acacia allows users to target compression to their file size or quality needs, significantly increasing the effectiveness of compression by adjusting to each individual image. It is available with a graphical interface, and with a CLI for batch processing. Acacia is free and open source, runs on Windows, Linux and MacOS, and is available on Github as source, or as a Windows binary. This software accompanies our paper, Predicting and Optimizing Image Compression, published in ACM Multimedia this week. The paper is available for free from John Thomson’s web site.